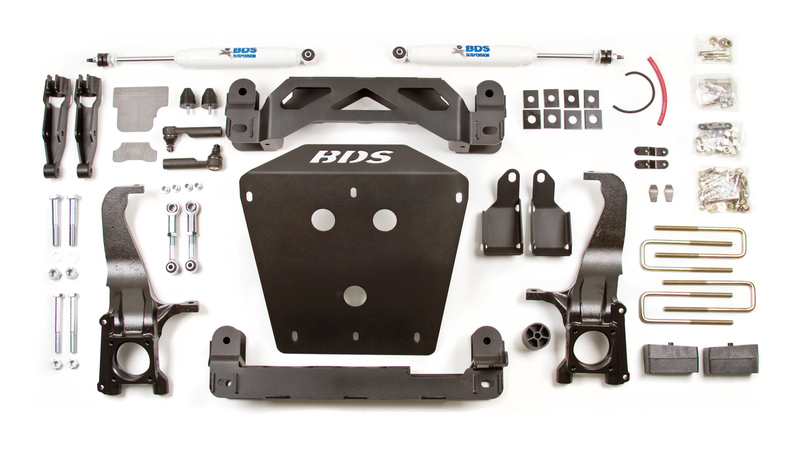 BDS Suspension has updated its kit listings to new include the 2018 Toyota Tundra models. This update includes all 3", 4.5", and 7" high clearance lift systems as well as available accessories like the performance UCAs, FOX shocks and coilovers, shackle kits, Recoil traction bars and more. 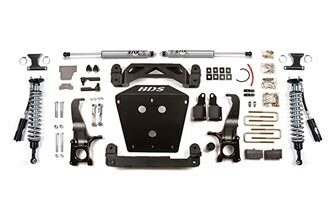 These kits are based off the widely popular BDS lift ktis for the 2007-2017 Tundra, now tested and confirmed compatible with 2018 models equipped with the new TSS-P system. As with all BDS lift kits, these kits are backed by Factory Protection Plus for piece of mind wherever your adventures may take you. Factory Protection Plus includes BDS’s exclusive No Fine Print Warranty along with a 5-year, 60,000-mile drivetrain warranty. 3" Lift Kit: BDS offers an easy to install 3" leveling kit designed to provide stock-like ride quality and room for 33" tires. 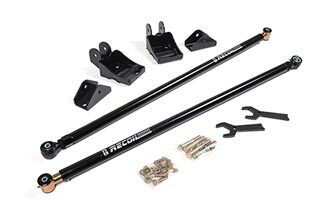 The kit uses a fabricated steel top mounted strut spacer designed to extend the length of the strut to provide 3" of lift. The spacers install easily without the need to disassemble the factory struts. Also supplied in the kit is new hardware to mount the spacers. 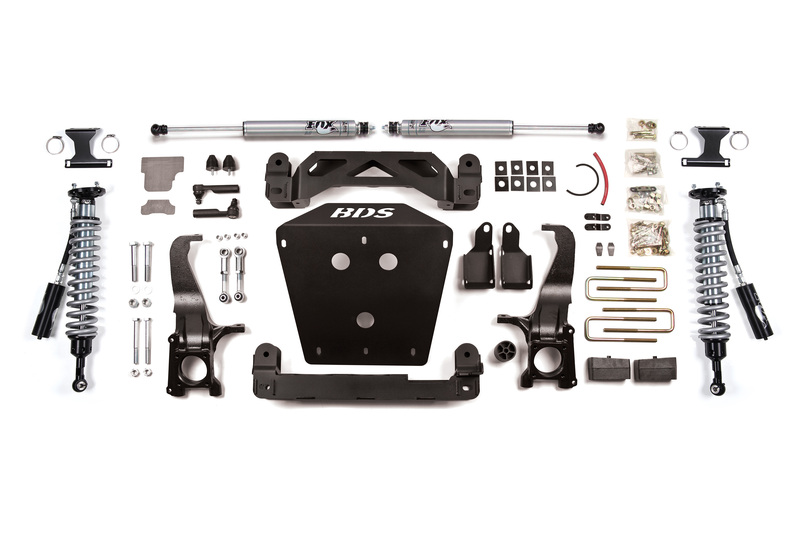 The kit is designed to eliminate the factory rake, however if rear lift is needed BDS offers both a 1" rear shackle kit as well as a 2" rear block kit along with your choice of rear BDS 5500-series hydraulic or precision tuned FOX 2.0 performance gas shocks. 4.5" and 7" High Clearance Lift Kits: Stepping up to the 4.5" and 7" high clearance systems, BDS offers complete systems engineered to a higher standard for improved performance on road and off the beaten path. 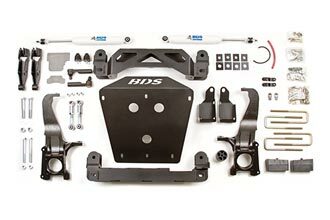 At the core of these 4.5" and 7" lift systems are a pair of laser cut 1/4" steel high clearance crossmembers and a full width belly skid plate designed to reposition the lower arms and add protection of vital drivetrain components. 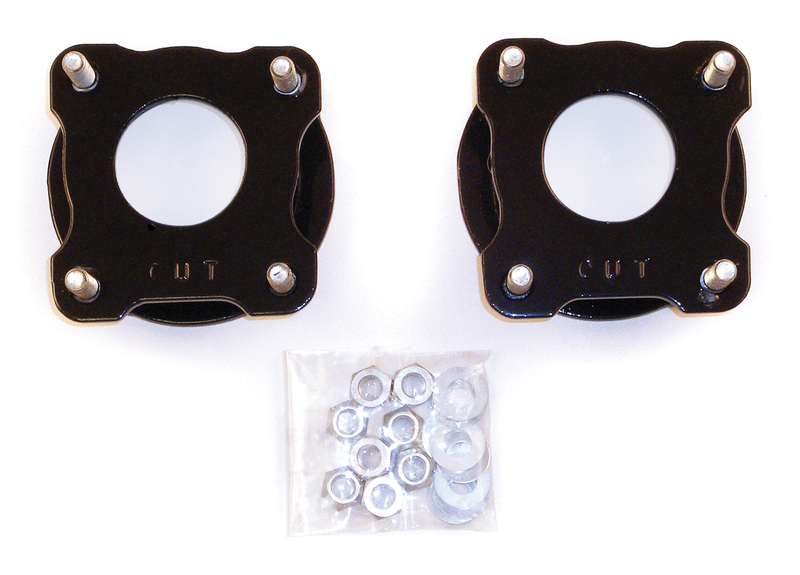 These combined with the CNC machined ductile iron replacement steering knuckles create a solid subframe and to correct suspension and steering geometry to be compatible with the factory installed ESC system. Up front the kits use a multipoint differential relocation kit to securely reposition the front differential to correct CV axle angles and allow for the use of the stock front driveshaft. Also included for the front are heavy duty tie rod ends, longer sway bar links, weld-in support plates, cam bolts, and brake line brackets. A lower strut extension is used to provide the extra ride height while maintaining factory ride quality. 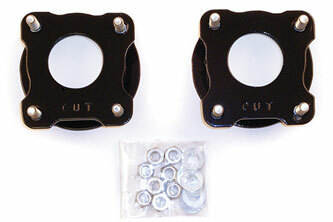 In the rear these kits are offered with a rear cast iron block and u-bolt kit to level the stance. Also included are rear brake line extensions and your choice of rear BDS-5500 series hydraulic or Fox 2.0 IFP performance gas shocks. The 4.5" system is designed to fit up to 35" tires while the 7" system allows up to 37" tires. 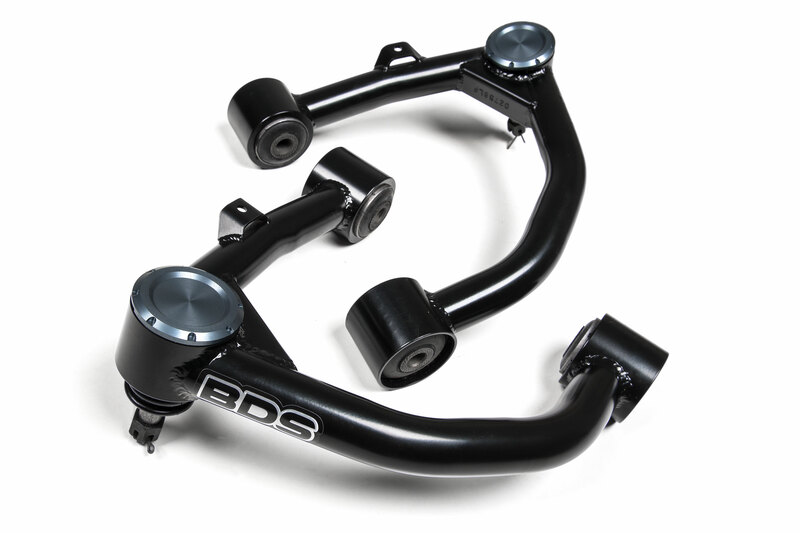 4.5" and 7" Performance Coilover Systems: For 2017 Tundra owners looking to get the most out of their trucks both on road and off, BDS offers the 4.5" and 7" performance coilover systems. Built from the core components of the BDS 4.5" and 7" high clearance lift kist, this system utilizes the same high clearance crossmember, ductile iron steering knuckles, differential relocation and heavy duty skid plate that have earned it notoriety among the Tundra community. In place of the lower strut extensions and rear BDS-5500 series shocks these systems feature precision tuned Fox factory series 2.5 remote reservoir coilovers up front and Fox 2.0 IFP performance gas shocks in the rear for exceptional performance and ride quality across any terrain. The Fox factory series 2.5 remote reservoir coilovers come prebuilt for easy installation and ready for perform out on the trail. 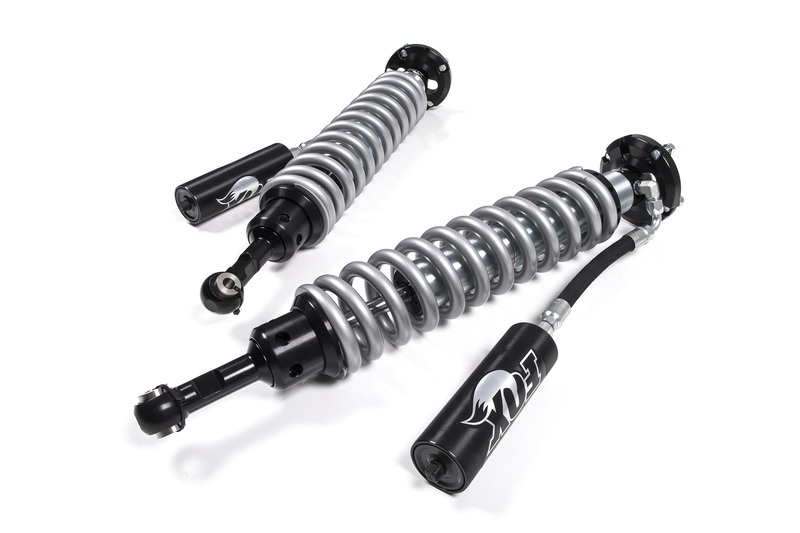 These FOX coilovers feature a smooth bore and honed seamless 2.5" alloy body, 7/8" hardened stainless steel shaft, FOX coil springs, black anodized machined 6061-T6 billet aluminum mounts and FOX patented technology inside for unbeatable performance. Current only offered at the 4.5" lift height these coilovers are available with DSC (dual speed compression) adjustment technology. The DSC adjustment allows for easy tuning of the vehicle’s suspension compression dampening to dial in the ideal ride performance to soak up the bumps, both large and small. The DSC has 12 adjustment points for the high speed compression as well as 10 adjustment points for the low speed compression allowing you to make large or small changes to further improve your performance. Adjustments can be made by simply twisting the "blue" high speed and "gold" low speed compression knobs located on the end of the remote reservoir of the FOX 2.5 coilovers. Whether you're looking for the smooth riding kit on the road or a Baja proven system, you can't go wrong with the BDS 4.5" and 7" Performance Coilover System for new 2018 Toyota Tundras. 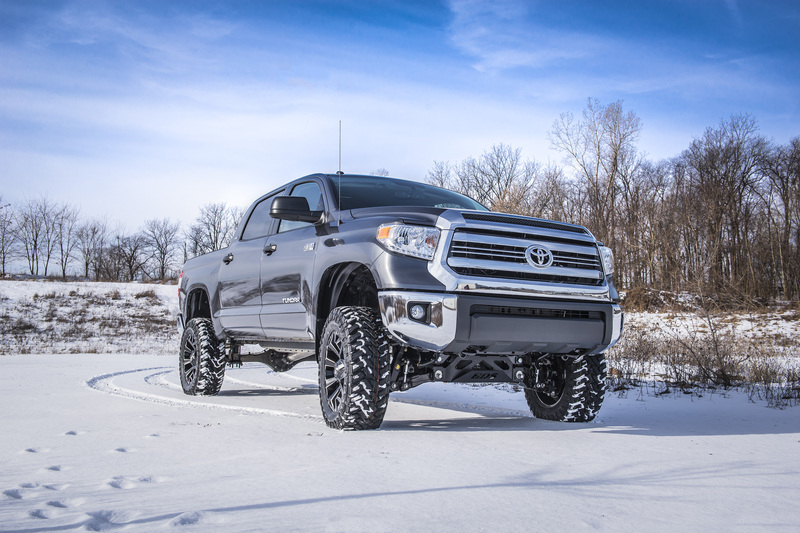 Tundra Accessories: BDS has developed a number of accessories for the late model Toyota Tundra to compliment available lift systems to further improve performance and capability. Among them are performance upper control arm (UCA) kits to allow for more suspension travel and offer superior strength and styling. These arms are built from 1.5" OD heavy wall tubing TIG-welded with support gussets, brake line mounting tabs and feature indexed ball joint cups to correct ball joint positioning for leveled and lifted applications. The come fully assembled with OE-style rubber bushings for the frame mounts and a high-quality MOOG ball joint for smooth, quiet operation and better durability than arms that use heims and uniballs. Also offered for the 2018 Toyota Tundra are Recoil traction bars designed to limit axle wrap under hard acceleration or towing without binding up the rear suspension like other traction bar kit Recoils use heavy wall construction and a full floating design that won't bind up the suspension during articulation. The new mounting kit is built from 1/4" steel and is an easy bolt-on install only requiring a few holes to be drilled at the frame. At one end, the bars use a forged flexed end that can be adjusted to load or unload the 3000lb rated compression spring at the other end. While we don’t expect any changes, at this time we have not brought the 2019 Tundra in to test fit and confirm compatibility with our current kit offerings. Once we do we’ll add an announcement (similar to this one) to update fit or announce any changes for the 2019 kits.